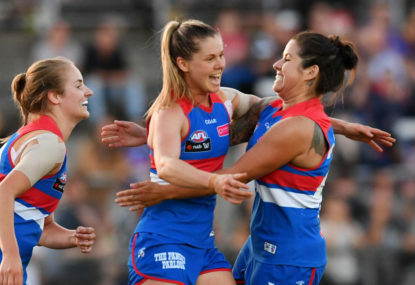 This weekend the second season of the AFLW will come to an end when the Western Bulldogs play the Brisbane Lions in the grand final on Saturday afternoon. 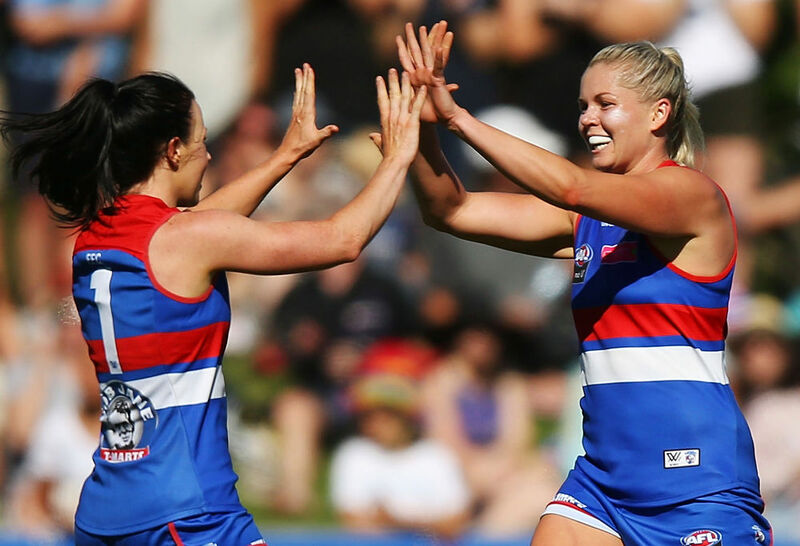 For the Western Bulldogs, with their win over the Melbourne Demons at the Whitten Oval last weekend they secured the minor premiership and a spot in their first ever AFLW grand final. It is also the first time a Victorian team has featured and is quite the turnaround from last year, where the Dogs finished with only two wins out of their seven matches. They have been a pleasure to watch throughout the season – largely because they are fighters. They have been without their captain Katie Brennan for three games due to an ankle injury and will be without her for the grand final after today’s unsuccessful appeal. Daria Bannister and Isabel Huntington were another two players sidelined due to injury during the season. But this did not stop the force that has been the Bulldogs with my favourite performance of theirs being their 73-point thrashing over the Blues in round 4. Their opponents this weekend will be the Brisbane Lions, who are playing in their second consecutive AFLW grand final. Heading into the final round of the season, the Lions were sitting fifth on the ladder and very few people were tipping them to beat the GWS Giants, who had not been beaten since Round 2. Then the Lions did just that. Comprehensively. And in the process posted their highest ever AFLW score (64) with four goals for Sabrina Frederick-Traub. Once the Western Bulldogs and Collingwood Magpies won, the Lions place in the grand final was confirmed. 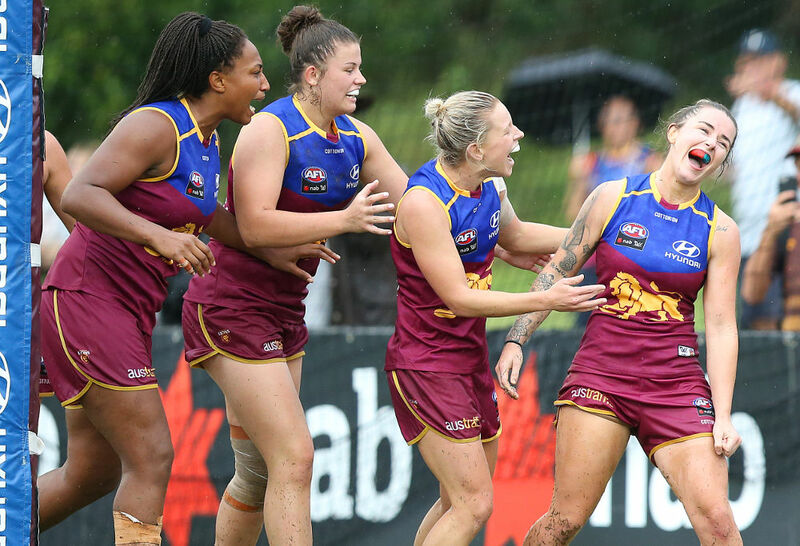 There’s only one question remaining – can the Lions can go one win further this year and cinch their AFLW team’s first grand final win? Once the trophy has been raised into the air, the players have left the field and the celebrations by the winning club are complete there will be quiet. But only for a short time before planning for AFLW season three begins. I have high hopes. We already know that the competition will expand next year to include an additional two teams (the Geelong Cats and the North Melbourne Kangaroos) taking the total number of teams to 10. I want the AFLW to be celebrated and respected for the product it is and I want the AFL to demonstrate its faith in the competition being able to stand on its own two feet. I found it exceptionally disappointing that only in the second year of a new competition, the AFL decided that rather than spending more money to promote the AFLW, they launched a product which competed directly with it, namely AFLX. And not just any product – a product with a launch including acrobats and parachuters and flashing goal posts which cost thousands of dollars to ship around the country. There was plenty of discussion about marketing of the AFLW competition this year and whether the AFL had reduced its spend. The AFL conceded that there had not been a reduction in spend but instead a redirection of funds from marketing (because there was thinking that there would be greater awareness about the competition in its second year) towards player payments, with the players being paid an extra $477,000. What would allow AFLW to promote and pay the players would be an injection of additional funding. Additionally, I would like to see changes made to the match review panel so we never, ever have another situation that plays out like that involving Katie Brennan this week. 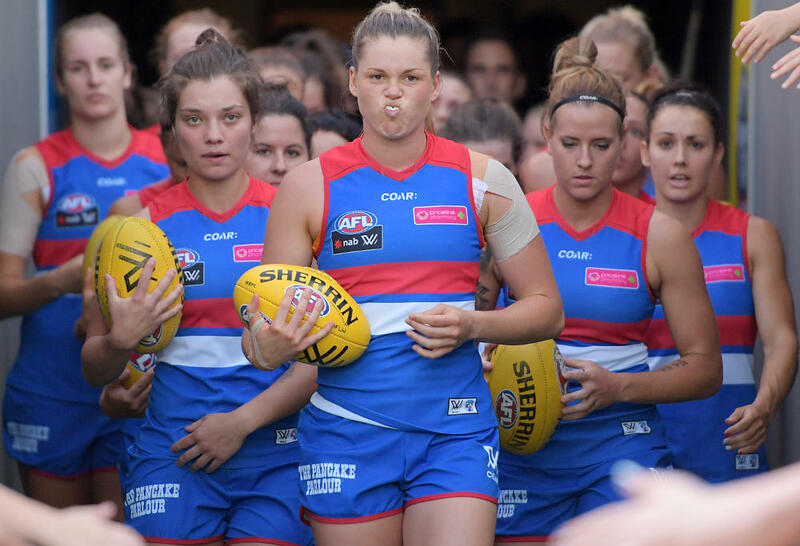 Katie Brennan will not have the opportunity to captain the Dogs in this weekend’s grand final because of an inequitable match review system. Initially, Katie was offered a one-match ban for her tackle on Harriet Cordner which was determined to be ‘unreasonable’ in the circumstances by the Match Review Panel. This decision was upheld by the tribunal on Tuesday night (and the ban was upped to two games) and was then upheld on appeal yesterday. What was also taken into account was that Katie had also been reprimanded for her conduct on two other occasions this season. What’s fascinating here though is that in the AFLM, a rough conduct charge results in a fine of $2,000 if it is the first offence and $3,000 if it the second offence. Women competing in the AFLW do not have the option of paying a fine and instead are reprimanded by missing time on the footy field. The AFL is correct that in the context of a competition where women are paid significantly less than their male counterparts, that a fine the same amount as the men is unreasonable. But instead of introducing a system which reflects the system used in the men’s and pro-rataing the fine, the AFL decided that for AFLW, only a reprimand system is available. This means that Katie, a pioneer in the women’s game, has been denied the opportunity to play in one of the most significant matches of her career. This is an exceptionally disappointing outcome and should never ever be able to happen again. Truth be told, part of me is also exceptionally disappointed in the Dogs, who used compelling arguments in their case on Thursday which should have been used in the initial challenge on Tuesday. They dropped the ball. I would like to see this process reviewed and changed ahead of the next season. Unfortunately, Katie Brennan has found herself on the wrong side of history. Some very careful thought will also need to be given to the expanded competition next year, particularly when it comes to finals. With ten teams in the competition next year, surely the case for a finals series becomes more compelling and a finals series which is not competing with the AFLM season for venues, eyeballs and support. This weekend’s grand final will be played at Ikon Park which has a capacity of about 25,000. This is the same venue that had a lock out imposed for the first game of the competition. I am confident that the venue will sell out and am hopeful that it does not end up in a lock-out, particularly if this impacts any fans travelling from Queensland to support their team. For next season, I encourage the AFL to dream big for its AFLW product and work towards filling up one of the larger venues like Etihad Stadium or the MCG. If this is to happen, then the AFLM season will need to be reconsidered. Should the game be a double-header or a stand-alone match? Should the AFLW season conclude before the men’s season begins? It is interesting that the AFL decided that the AFLW should start after the Australian Open to give it space to ‘breathe’ but then interestingly decided to dump another whole competition right in the middle (AFLX). My preference would be for a stand-alone match before the AFLM season begins. This would give the AFLW the opportunity to end with a bang and be the perfect introduction to the AFLM season which would begin the week after. But before we think about AFLW Season 3, I have one more game to watch. Good luck to both teams competing – I’m tipping the Lions for the upset. To those players and clubs which are not competing this weekend – thank you for another wonderful season of women’s footy. I can’t wait to see what you can all do again next year.